After all my moaning about our hot weather (Canberra has had some crazily hot and dry weather statistics this summer), I’m curled up on the couch with a blanket. We’re expecting an overnight low of 9°C (48°F). Madness. Anyway, it means the children are in their winter pajamas – and Elena’s getting the chance to give her panda pjs a run a lot sooner than I thought she would. As I suspected, the size three is very big on her. That’s okay though – winter won’t be here for a few more months and I want them to last a while after all that sewing! I was laughing as I was loading up my photos. I usually take pictures before we head out the door to childcare. This is what things look like after a day at ‘school’, just before we brush our teeth and plait her hair for bed. Messy and crazy tired. Look mamma, I’m a bird! 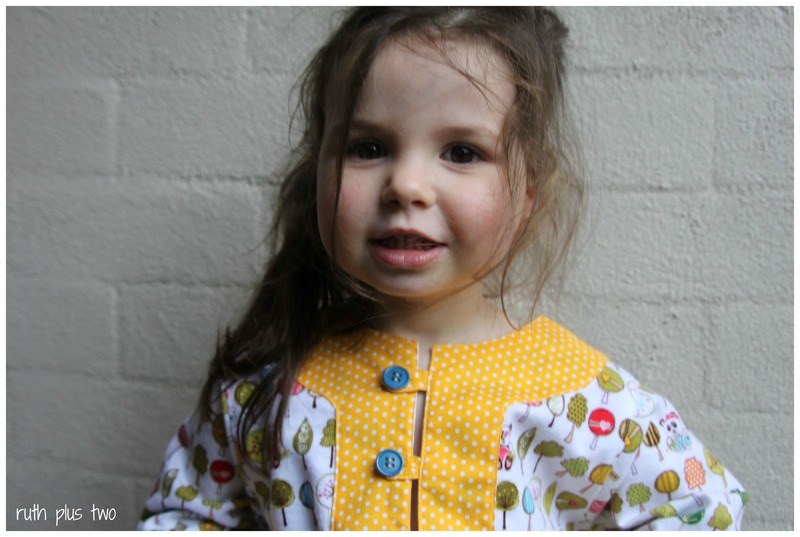 This entry was posted in clothes for children, Made by Rae, sewing. Bookmark the permalink. What? No sand and mud all over her precious face? Little Monkey comes home covered in mud and I am sure she is on a mission to relocate a sandpit from her childcare into our house haha Elena’s new pj’s are absolutely fabulous! It was freakishly cold here last night and this morning… well, maybe it wasn’t but seriously, 28 does feel cold after a few days of over 40! I got the fabric from our local fabric store – Addicted to Fabric – a year or two ago. Some searching online turns up that it is Riley Blake, Sunny Happy Skies. 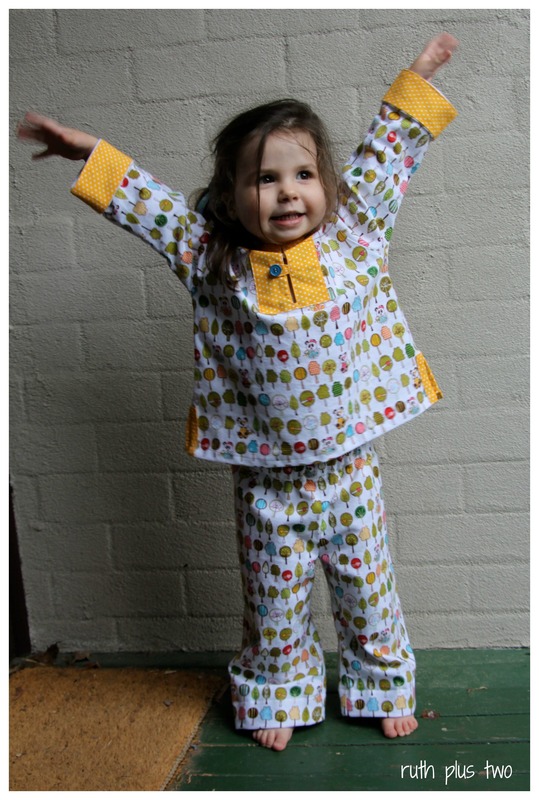 Lovely pajamas (and adorable daughter)! My daughter is still a bit small but I will definitely place an order for something like it with our personal and very eager seamstress (her grandmother) when it’s time. Did you design it yourself? 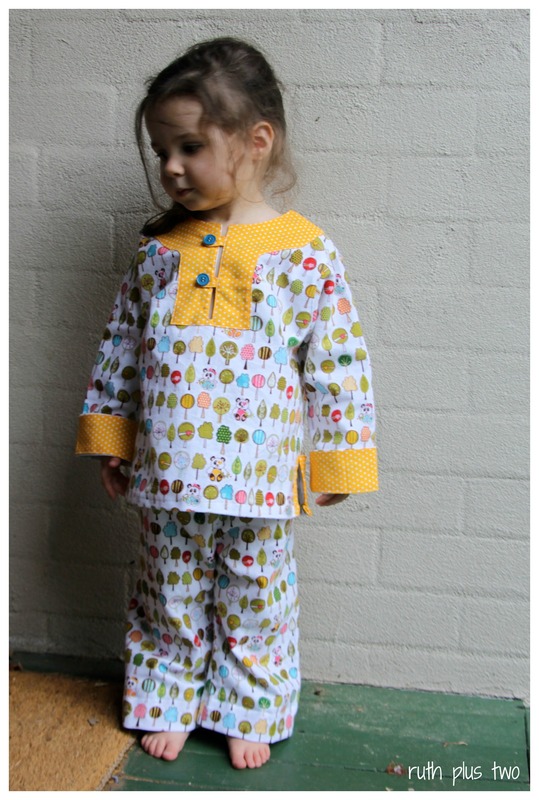 Thank you 🙂 I didn’t design the pjs myself – both are ‘Made by Rae’ designs – the Charlie Tunic (top) and Parley Pants. They have proven very comfortable and Elena really loves wearing them.